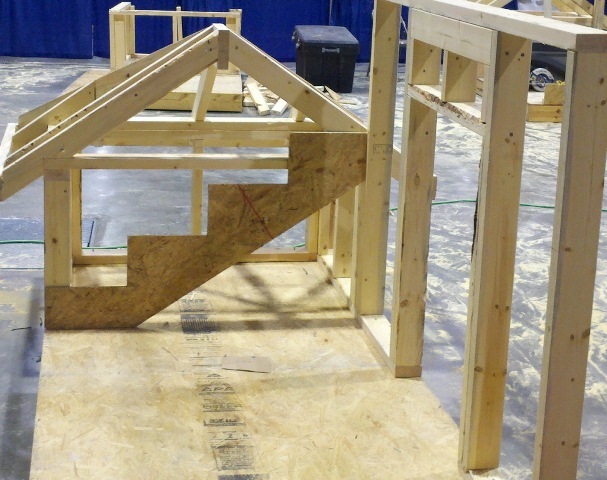 This last week as part of the SkillsUSA Alabama State Competition, the Carpentry competitors all got to try their hand at it on the last day. While some students did pretty good most of them had some issues. 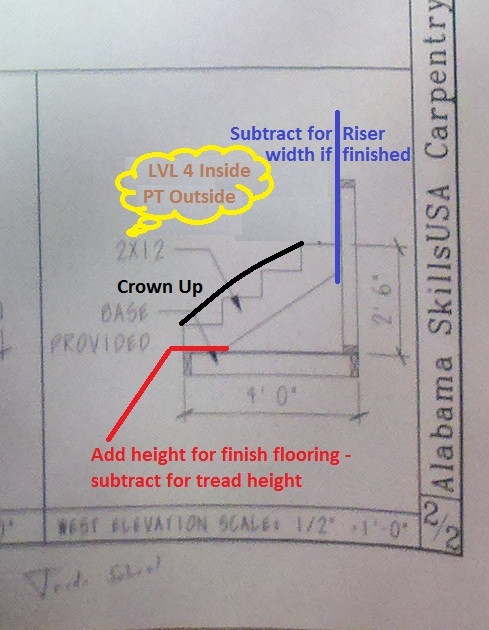 To make it more interesting the plans provided required one to do the math as the answers one would get from a Construction Master® calculator (or just remembering 7/10 or 7/11) would not give them the answers they needed. With this in mind, let’s take a quick look at some of the code basics, the results and tips to get it right the first time. The reason for the codes? 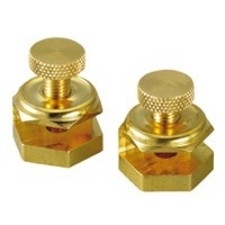 Quite simply it is because it is what feels normal to most individuals, and helps eliminate tripping hazards. For example in a commercial building I worked at, we lost power & the emergency lighting failed to kick on, yet I was able to still head up the stairs without tripping. 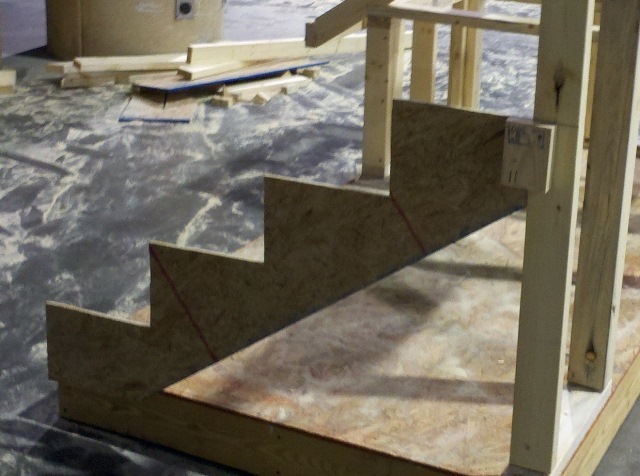 This is a part of the plan that everyone got – a simple stair stringer with 4 risers & 4 treads. What made it more challenging is if you simply plugged the rise in to a construction calculator, you would end up with 3 treads. If you plugged in the run @ 4’ you would end up with 6 risers. 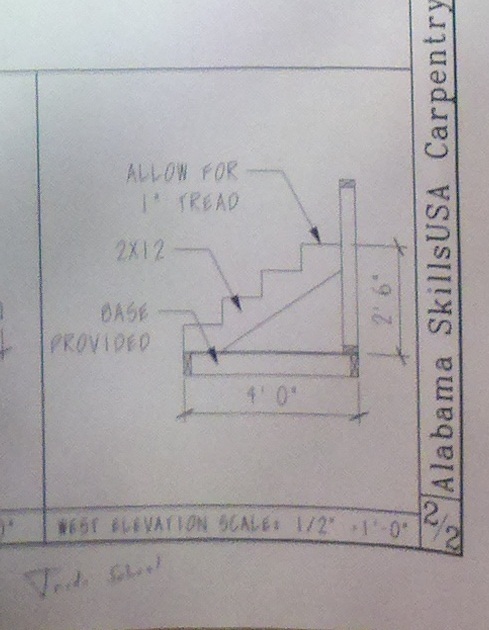 If you were reading the plans correctly & took off the 3 ½” for the wall you would end up with 5. 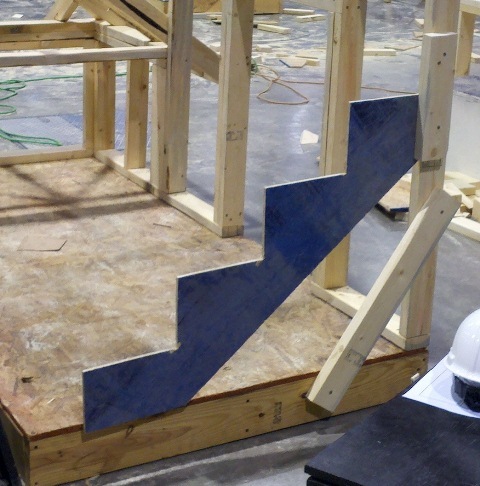 In order to get the correct size you had to take the rise & divide that by 4 (number of risers needed) and then take the run & also divide that by 4 (number of treads required) which ends up being 7 ½” & 11 1/8” (maybe). Dead on, but is it – just what does that allow 1” for tread really mean? The first one completed & the only one to nail it to the first day’s work. 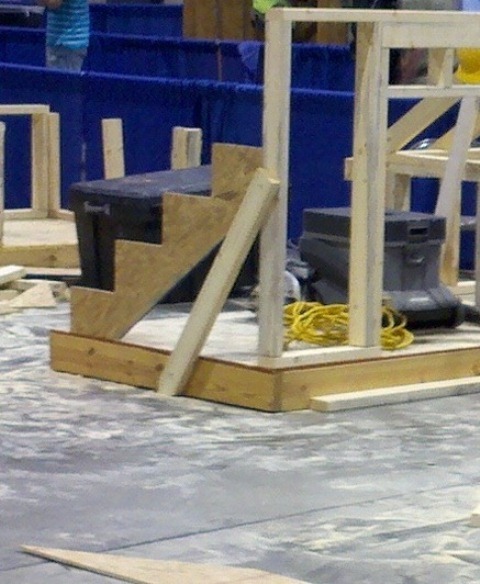 Interestingly if you look at the bottom step, you might notice that the one riser is an inch or so shorter. So is it right, or is the one above? In the field that question is generally a little more clear cut whereas in a competition, this is one of those items you might want to get clarified when the plans aren’t fully specific. Amazingly off the same set of plans we arrived with 6 different stringers and yet they could all still be wrong. When one is in a competition like this you need to make sure that you ask for clarification on items you might not be sure on. 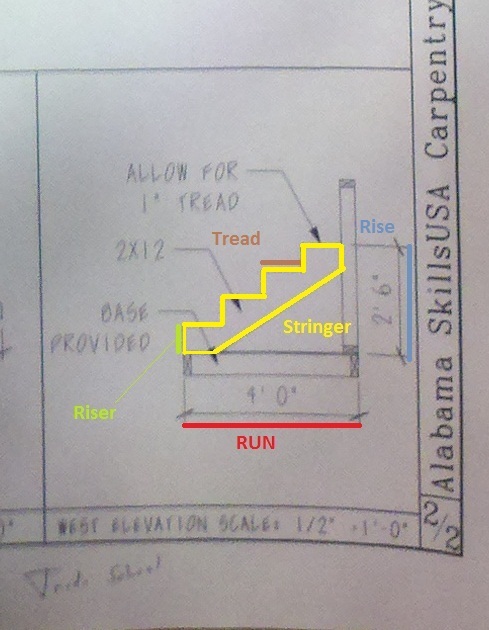 Is the 2’ 6” mark for the top of the tread or stringer? 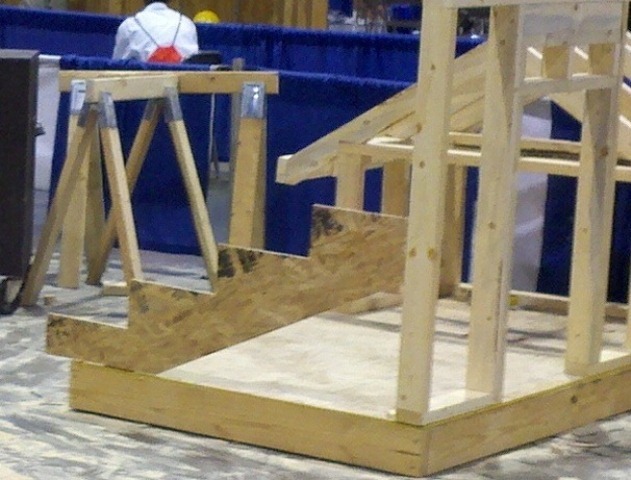 Is the bottom step really the bottom step / do we need to remove some for the tread? 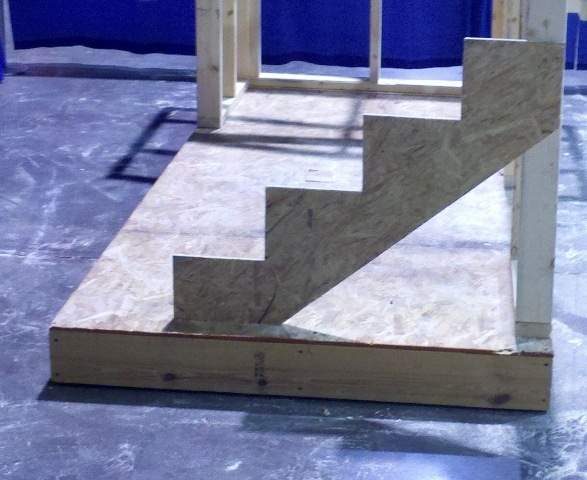 Is the top step really the top step / do we need to account for any riser thickness? As an FYI, me showing & using these plans is not an issue as all the ones that have been or are used in competition are shared with all the teachers afterwards so they can use them as guides & teaching tools. 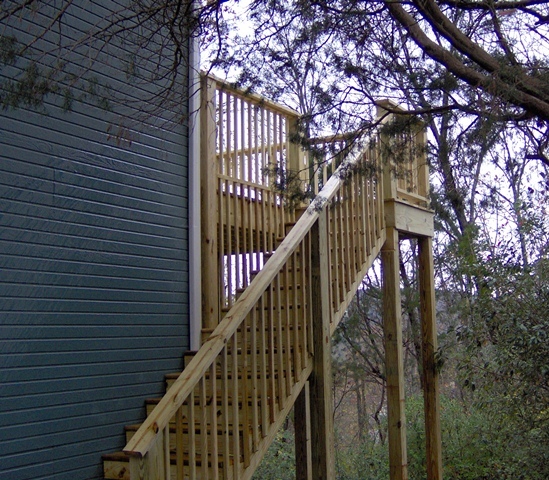 For exterior stairs, the wood needs to be Pressure Treated with the crown up. One trick we also employ is finding the biggest knot(s) and we adjust our cut layout to make sure as many of them can be cut out.